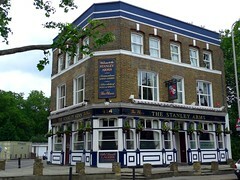 An old-fashioned boozer on [Southwark Park]? Road in Bermondsey, one of a dwindling number in these parts. Whatever preconceptions people may hold about pubs in South-East London certainly don't apply here. This place is extremely clean, with well-kept carpets and fittings, fresh paint on the walls and ceilings, and a long bar with brass railing running along it. Service from the landlady was chatty and friendly on Ewan and Kake's late-night visit in June 2009, and even close to closing time there were still a few relaxed groups of locals lingering about the place. The decor is simple, with a horseshoe bar in the centre with stools along it, and table seating around the outside. A standard range of draught lagers are available at the bar, including a Portuguese lager called Sagres, and Strongbow cider. There are no handpulls, but keg Courage Best. They also had a keg tap for Theakston's Mild (though this was covered up on our visit). On another visit by Kake in April 2011, a half of lime and soda was a rather steep £1.90, mainly because they only do soda in bottles rather than on draught. Accessibility: Step-free at one entrance, a couple of steps at the other. However, as of April 2011 the step-free entrance is out of use. Last edited 2011-04-11 15:52:03 (version 3; diff). List all versions. Page last edited 2011-04-11 15:52:03 (version 3).